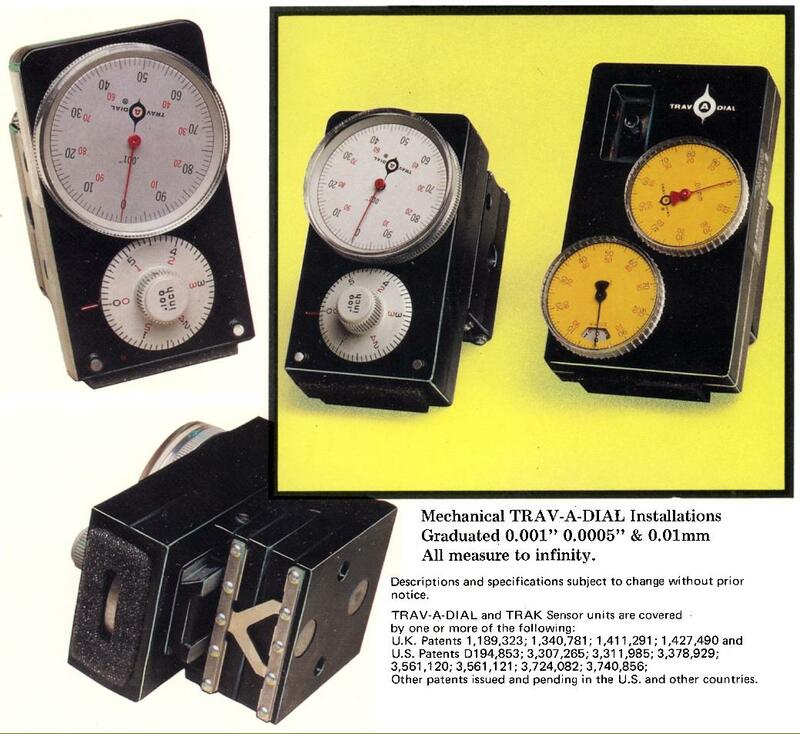 An ingenious device - and widely used from the early 1960s until the advent of digital scales - the Trav-A-Dial had an unlimited length-travel capacity and could be fitted to measure the travel of almost any two surfaces sliding against each other. 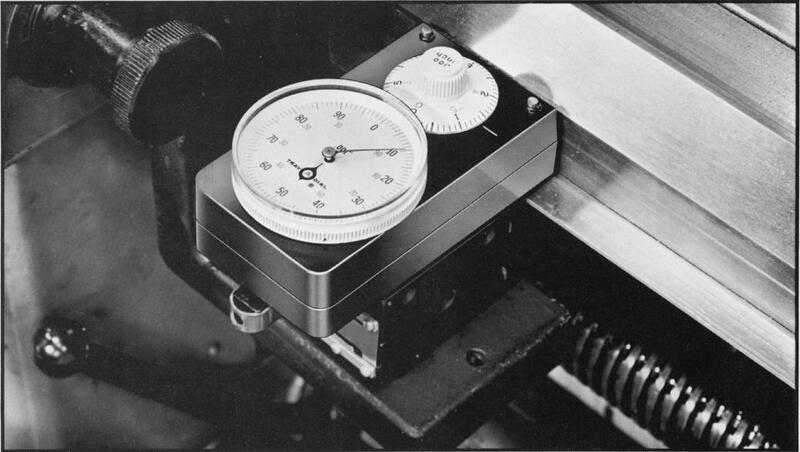 A number of models was offered over the years including the 6A that was graduated to read in increments of 0.001", the 6B that measured down to an accuracy of 0.005" and the 6C, a metric version graduated to 0.01mm. 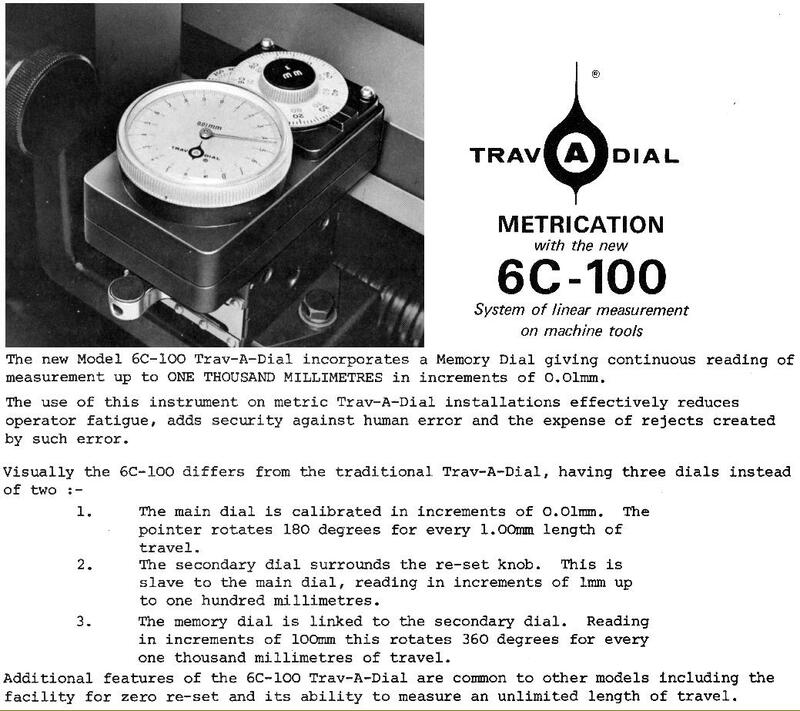 A later version of the 6C, the 6C-100, was able to check travel to an accuracy of 0.001 mm in increments of 0.01 mm. To do this, three dials were employed, the main one being calibrated in increments of 0.01 mm with its pointer rotating 180 degrees for every 1.0 mm of travel. A secondary dial surrounded the re-set knob, this reading in increments of 1 mm up to 100 mm while the third dial, called the "Memory" read in increments of 100 mm and rotated 360 degrees for every 1000 millimetres of travel. One disadvantage of the system was that it had to be installed by a suitably experienced technician who installed a tracking surface against which travelling wheel engaged. When first fitted the travelling wheel was set to "imprint" the track, being moved along the full distance in each direction to accomplish this. Once done, the reading of the dial was checked against a standard over a set distance and could then, if necessary, be finely adjusted to remove any error. Keeping the track clean would help to extend its very long service life but, if removed for any reason, the unit would need recalibrating. 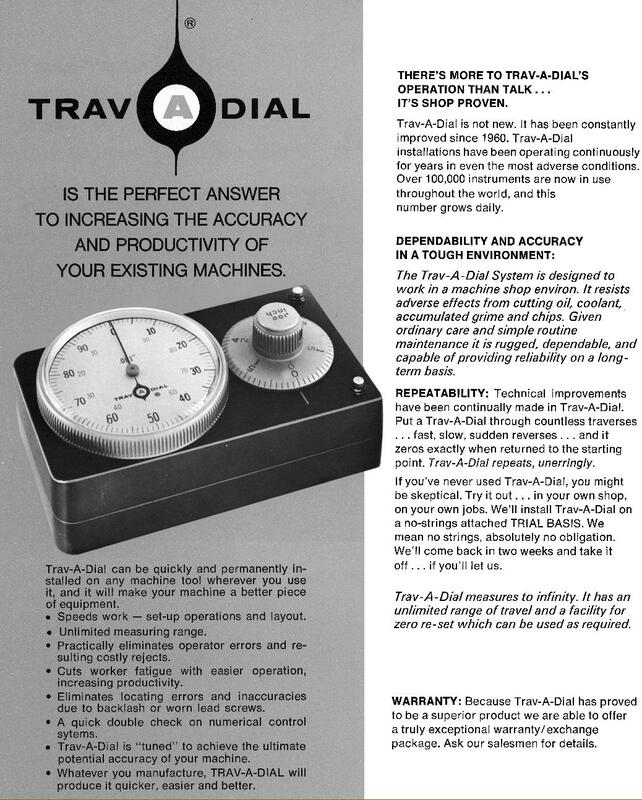 One feature of the Trav-A-dial reported by some users is its ability to accurately regulate a "count-down" distance, the reading of the analogue dial making it possible to "hit a number" each time, something more difficult to accomplish with a DRO. 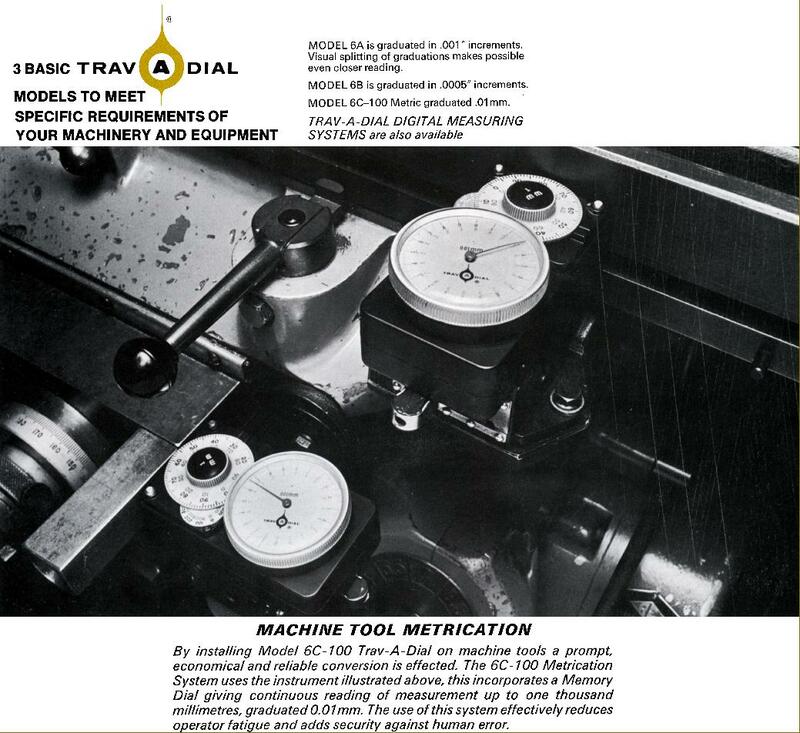 While the use of a Trav-A-Dial on a lathe still has a place in many 21st century workshops, on a milling machine there can be no doubt that a 3-axis DRO performs is an easier and more efficient solution and, indeed, many users prefer them to a Trav-A-Dial on a lathe as well.